Buck is a terrific 70lb 1 yr old black lab pup—loves dogs, people, not a barker, crate trained, and what I call a boomerang pup—loves to explore but always comes back! He is strong and smart, not stubborn or willful and is controllable by a 5’2’’ woman, so please don’t think he isn’t the dog for you! He sits and gives a paw, loves to snuggle with his nose under your chin, housetrained, understands no, not a counter surfer,doesn’t jump on people,and plays with his toys quietly in the house— outside, will make a true jogging companion- he is a love and wants a forever family to adore—don’t wait to apply for Buck. Large dog experience preferred, a fenced in yard is a must. He is a strong dog but really wants to please. He's not a spaz like some labs, he's just a big boy and a REALLY GREAT DOG! 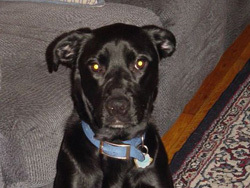 Molly is a female black lab that is being relinquished due to divorce. She is a sweet girl; She enjoys her toys and is happy occupying her time when her owner is at work, playing with them and awaiting her owner's return. She has not been in a home with kids, but nieces ages 8 and 13 visited often, and she is very good with them. 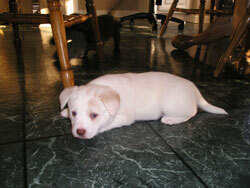 Alana is a mixed breed pup. 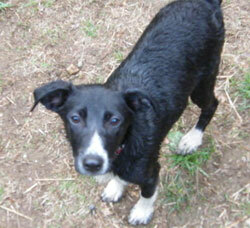 We listed her as pointer mix or terrier, but she but she is probably a mix of many breeds, ie., heinz 57. She is a calm puppy, not at all hyper. She is a medium energy puppy and a really good pup. She is in a foster family with school-aged children and is doing great! She is crate trained and almost house trained as well. She is very well behaved. She weighs 10-15 lbs. She is available NOW. She is good with cats! 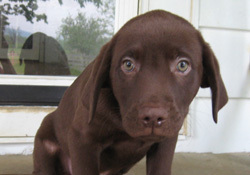 3 Chocolate Lab Puppies - All Males. This is Baloo. The pictures do not do them justice! They are cute as can be and you won't find a sweeter bunch of pups anywhere! Please note: We've had more applications than we can handle so if you haven't applied, you might want to wait for a future group of dogs. 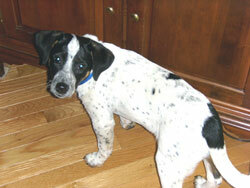 Baylee is a terrier-pointer mix who has arrived and he still weighs approx.15 lbs. No phone calls, please. He has a naturally bobbed tail, but is too small to be an Aussie. Does anyone have any ideas on this breed? Min pin? Boston? Cocker? He has the face and look of a spaniel with a rat terrier body. 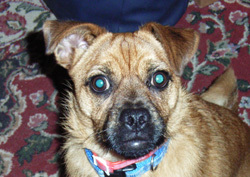 Buddy is a one-year old Pug/Terrier mix with high energy, but just a GREAT dog all around. 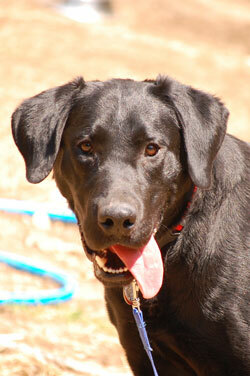 He's very personably, happy and loves to play and go for walks and see the world! He would make a great walking/running partner. He can go for a mile run and then come back home and play for another 45 mins til he crashes. He's still very puppy like and loves to play with his toys, ball, and chew on chews. He spends his down time napping and chewing or snuggling in his foster's lap. Buddy was relinquished because his 80 year owner could not keep up with his high energy, and this is SO typical of the terrier breed. He will make someone a wonderful companion, but they must understand Buddy's need for excercise (several walks/runs a day) or he wont be a happycompanion and neither will you. Buddy is neutered and up to date w/shots. He weighs 15 lbs. Are you looking for a little guy like Buddy to be YOUR "Buddy"? If so, please fill out an application on our website. 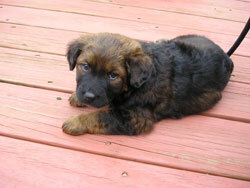 Casper is an adorable shepard mix puppy whose mother was found as a pregnant stray. She was taken in and fostered and then her puppies as well. Their mom is a shepard mix, but we dont know anything about the father. Casper is approx. 13 weeks now. He is arriving on the 14th and will be at our Meet and Greet on the 17th. See Events page for details. 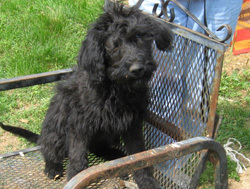 One of Hannah's puppies, Sherman is a Flat coated retreiver who will arrive on 5/14, and be available on 5/16. Siblings are Pebbles, Kaley, Kendra, Dessa, and Quinn. They were born on 1-12--8 and the whole litter are typical adorable, busy puppies that like to play with squeaky and rope toys & with each other,and get all excited when I give them a new toy! It's the little things in life that mean the most! These precious puppies are looking for their forever homes. If you are interested, please fill out an application. Skippy is a 1-1/2 yr old Sheltie/Corgi mix. 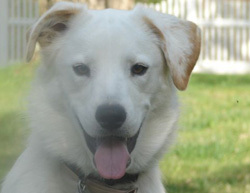 He is a wonderfully playful dog, plays like a puppy, loves to be chased and to give chase. He loves stuffed toys and will carry them around in his mouth. Skippy was owner surrendered.....it's hard to believe he was kept in a pen and had little attention. 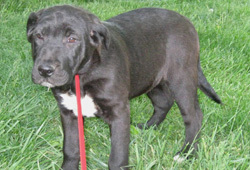 He is very active, playful, loving and gets along fine with other dogs and loves everyone. Don't know about cats. He is very friendly with strangers and is cute as can be. He has short legs and thick coat. He will make some family a great companion! He will be at our Meet and Greet on Saturday, 5/23/08, from noon to 2 PM at Especially for Pets in Wayland. No phone calls please! 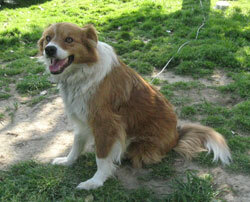 Sparkie is a 3 year old, purebred tricolored red, Mini Australian Shepherd. He is great with dogs and horses and somewhat shy with people he doesn't know -- he doesn't do crowds so is not a dog to take to the fireworks or to a parade. His owner regularly goes to horse shows and he's too nervous in crowds so he must stay home alone a lot. Owner is seeking a better life for him with people who can give him more attention and to better socialize him. He is fully housetrained, owner works and he's great in the house, not destructive at all. He lived with a 10 year old boy and a grandmother and grandpa and was very attached to the grandpa. He used to play with the ponies at the barn and would get them to chase him through the fence. 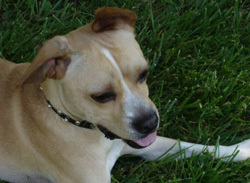 This dog has a lot of personality, a lot of smarts, and a lot to offer to the right owner. We're looking for previous dog experience, someone who has rescued before or someone with dog training experience. Ideally also, a quiet household, possibly with another dog for companionship. Horses would be a plus as he's in his element with horses. He will not be at the 5/17 meet and greet, but will be at the 5/24 meet and greet. We met Sparkie and can confirm he is a gorgeous dog with a mild personality, very sweet. 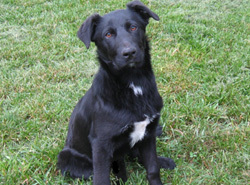 Thumper is an adorable shepherd mix puppy whose mother was found as a pregnant stray. She was taken in and fostered and then her puppies as well. Their mom is a shepard mix, but we dont know anything about the father. Thumper is approx. 13 weeks now. These puppies will be arriving in the next week, and we are currently accepting applications. Daisy is a 2 1/2 y.o. terrier mix who is still with her owner. He must give her up due to serious health issues. He loves her and wants the best placement for her so Save A Dog is screening applicants. He says she is an absolute delight. One of our volunteers met her and said is a really nice dog, very well mannered. You can see from the picture she is very comfortable in a house so the adjustment would be minimal. Please apply and we will arrange a private appointment to meet her. 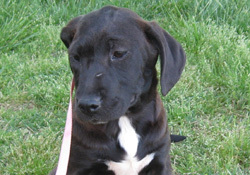 Dolly is a beautiful female lab mix with a big heart. She loves people and shows her affection as often as she can get a lick in. Although she loves attention, she is a calm and secure dog and can spend time alone at home. She is very well behaved, likes to learn new tricks, be outdoors, has lots of energy and loves to run. She has sensitive skin and a mild itch, alleviated with bathing. She would do well in a home that would allow ample outdoor space for releasing her energy as well as either another dog or children to play with. She loves going for walks, riding in the car, and just being with you. She knows many commands such as sit, give paw, lay down, stay, come, heel. She is the perfect dog and deserves the perfect home. Also, she is housebroken and crate trained. Dolly was previously placed by us. Her owner was in a very serious car crash 2 months ago. His family took Dolly in hoping it would be a temporary commitment, but there have been complications, and they are afraid Dolly can not return to her "real home". They have other commitments/animals and cannot keep Dolly permanently, as much as they love her. They hope that she'll find another wonderful home where she'll be appreciated and loved and doted on, as she should be! Harley is now Charley and is doing great in his new home with his big sister, Jolie! Harley is a beautiful tan and white neutered male weighing only about 25 lbs. He is an energetic and a very fun, loving little guy. His favorite past times are playing tug, frisbee, ball, taking walks, and a nap under the covers. He is microchipped, housebroken & crate trained. He does OK with older children and other dogs. 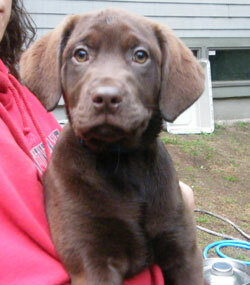 3 Chocolate Lab Puppies - All Males. This is JoJo The pictures do not do them justice! They are cute as can be and you won't find a sweeter bunch of pups anywhere! Please note: We've had more applications than we can handle so if you haven't applied, you might want to wait for a future group of dogs. ADOPTED! 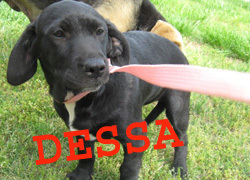 Kendra, one of Hannah's puppies, a Flat coated retreiver, is here and waiting for her forever home. We showed her this weekend and she was sleepy so didn't show her true sweet personality. She is crate trained, great with everyone, and very easy going and well behaved. 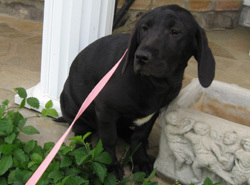 She is a rare pup who could go with younger children because of her gentle personality. We have NO applications current for her and NO competition, while everyone is waiting for the new puppies to come in, she is sitting here languishing. It does not make sense, because we have way too many applications for the incoming puppies and here is a puppy ready to go home today being passed over. Please show us that you have a heart for rescue by applying for a needy puppy today! Please note: We've had more applications than we can handle so if you haven't applied, you might want to wait for a future group of dogs. These are the three female Lab Puppies. They were born on Valentines day. Their mother was found near a business in an open field with coyotes after her. She was only a couple of weeks away from having the pups when the man found her. He turned her over to a rescue and they fostered her and the pups until the pups were 5 wks old. The mom is a beautiful choc. lab. These pups are beautiful....gentle, playful, good natured, love to be picked up and held. They love to play with balls and squeaky toys as well as each other. Luvie is the smallest (approx 17lbs) and a little shy at first, but likes attention. She will stay to herself some and just relax and look around. Raven is the largest (approx 20-25#). She is happy and playful and can hold her own with her brothers! Tinker Bell is around 20# and is happy and playful and curious. She will leave her food every time and come for attention. I can say to her "you had better eat your supper" and away she goes back to her food! 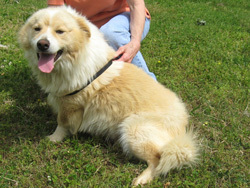 Lassie is a 2-3 yr old female mix who was listed as a collie mix by the shelter, but she has the appearance of a Nova Scotia Duck-Tolling Retriever. She is very friendly, very sweet, gets along with other dogs and kids. She was owner surrendered after being tied to a tree for much of this past year and pretty much neglected. . She is spayed, utd on shots. She loves to be hugged and loves to play. Lassie will make a great dog for some active family with tweens and up. Because of her ordeal, we're hoping she can be the only dog and get lots of attention. She is around 40#. Lassie smiles (don't think she is showing her teeth in aggression....she is not). She is friendly with strangers. She was with dachshunds and was fine with them, but generally ignores other dogs as she wants to be with the people. She is a cuddler. The woman had kids and Lassie was fine with them. Good in the car, fine on a leash. The woman had cats and Lassie did not seem to care one way or the other about them the daythe rescue worker went to pick her up. You can meet her today once we receive and review your application. 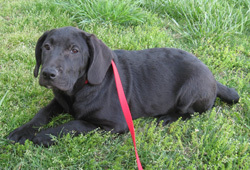 Marty arrives on the 21st and will be at our 5/24 Meet n Greet Marty is a 4-6 mo old black lab mix pup. He is sweet as can be and very calm for a puppy. We have him in MA now and he loves to retrieve and run around with a stuffed animal in his mouth. He has the beginnings of bringing a ball back. Foster mom from TN wrote: Marty was dropped in a rural area and a friend of mine found him and asked me to take him. He is super calm for a pup, friendly with all my dogs, friendly with people. Don't know about cats. He comes to me after he eats to be petted and sits very still for as long as I will pet him. 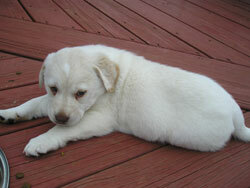 He is playful....loves to play with my 25# male eskie as well as a 50# female shepherd. He comes into my closed in porch through a doggie door and doesn't destroy anything or have accidents! He is a typical puppy though......he will claim things for his own and take them outside to play with. He loves to take his blanket outside into the yard to nap on! If I could just teach him to bring it back in when it rains! He also likes to carry his bowl around with him. Plays with toys, Nylabones, rope toys and sticks.....sticks are his favorite!!! He is good in the car. Learning to walk on a leash. Not truly housebroken, but it's a start that he never has accidents when inside on the porch. Pebbles is a terrier-pointer mix who is coming soon. SHe weighs approx.15 lbs., is one of Hannah's smaller puppies. She will be available after 5/16/08. They were born on 1-12--8 and the whole litter are typical adorable, busy puppies that like to play with squeaky and rope toys & with each other,and get all excited when I give them a new toy! It's the little things in life that mean the most! These precious puppies are looking for their forever homes. If you are interested, please fill out an application. We have had too many applications for these 3 Chocolate Lab Puppies so please try to understand that we can only bring up as many dogs as are safe for us to quarantine at one time. We have more coming and will bring pictures to our Meet and Greet on Saturday, the 24th at Especially for Pets in Wayland, from noon to 2 PM. All Males. This is PeeJoe (Peter Joseph), named after a dog in a children's storybook. The pictures do not do them justice! They are cute as can be and you won't find a sweeter bunch of pups anywhere! PeeJoe will not be at the meet and greet on Sat. Prissy is an adorable 13 week old shepherd mix puppy whose mother was found as a pregnant stray. She was taken in and fostered and then her puppies as well. Their mom is a shepard mix, but we dont know anything about the father. She is arriving on the 14th and will be available after the 16th. She should be at our Meet and Greet on the 17th, but check the web site before coming to see her as she is a very popular dog and we have several applicants who are preapproved. ADOPTED! 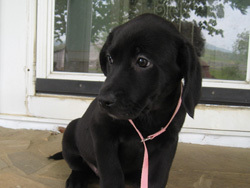 One of Hannah's puppies, Quinn is a Flat coated retreiver mix who is doing great in his foster home. Crate trained, plays well with other dogs, very well behaved. Siblings are Pebbles, Kaley, Kendra, Dessa, and Sherman. 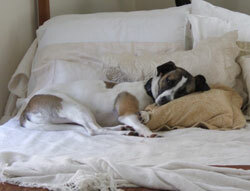 UPDATED: Sally is ADOPTED and doing very well in her new home. Suzie and Sally were sisters who were relinquished by an owner who didnt have time for them. She kept them in a pen. They deserve a great home where they can be loved, get alot of attention and activity/play time.They are both very sweet and playful! Sally had an eye injury that was not attended to by her own,er and by the time she was taken into rescue, it was too late, and the eye had to be removed.